I'm a casual bowler and these shoes feel great. Just joined a league. This was our first purchase and the shoes couldn't be more comfortable. I am a beginner and didnt want to spend a lot and was tired of renting shoes. Wish you would make wider sizes & with velcro straps. Never Ever Shoe Rental Again! These shoes look & feels great. It's the 1st time I've owned bowling shoes. I've always used Dexter shoes. I bowl 3 times a week and their great! Good quality bowling shoe; good stopping ability on approach. Stability good! I bought these bowling shoes for my husband. I had to exchange them for a 1/2 size larger which were perfect. I would suggest getting the true-fit guaranteed. He is a beginner bowler so I can't comment on the anything but the fit. By Deepfreeze from Largo, Fl. I like these bowling shoes. I have only had them a few weeks but they seem fine. Can't say how well they will hold up as they are very light. I would recommend them to anyone who needs some inexpensive bowling shoes. Nice shoes but had 3 weeks of trouble breaking in the sliding pad for my approach. Nothing I did helped them stop from sticking, not even powder. Hi! Yes this shoe does come in a wide width. do you carry wide with shoes? Hello Big Joe! This shoe has universal soles, which means it has slide soles on both feet. It works for either right or left handed bowlers. CAN BE RETURNED FOR SIZE ? These are for both right or left handed bowlers. Would you order the same size shoe as you normally wear or do they run small? It is impossible to know exactly how this will fit you unfortunately. I would not suggest a closeout shoe if you have any concerns on the sizing. 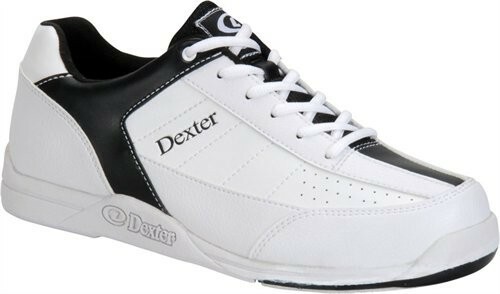 If you had purchased Dexter shoes before then you could use that same size but if you have never had Dexters before I would try a Dexter that was not on closeout so you could return or exchange it if it did not fit. Due to the time it takes to produce the Dexter Mens Ricky III White/Black ball it will ship in 2 bus. days. We cannot ship this ball outside the United States.